The Indian Army and Japanese Army on Wednesday completed their joint military exercise, ‘Dharma Guardian – 2018’ at the Counter Insurgency and Jungle Warfare School, Vairengte in Mizoram. It is a significant step towards fostering military and diplomatic ties between the two countries. The primary focus of the exercise was to train and equip the contingents to undertake joint counter insurgency and counter terrorist operations in urban and semi-urban terrain. “The participants were initially familiarized with each other’s organizational structure, tactical drills and planning process before graduating to joint tactical exercises. The contingents honed their tactical and technical skills in a wide spectrum of counter insurgency operations in including joint training on weapons and equipment, field training exercise and handling of improved explosive devices,” stated Guwahati-based defencePRO Lt Col P. Khongsai in a press communique. Commanders at various levels from both sides were exercised to work in close coordination to receive and collate information jointly, plan operations and issue suitable orders to respective integrated groups. 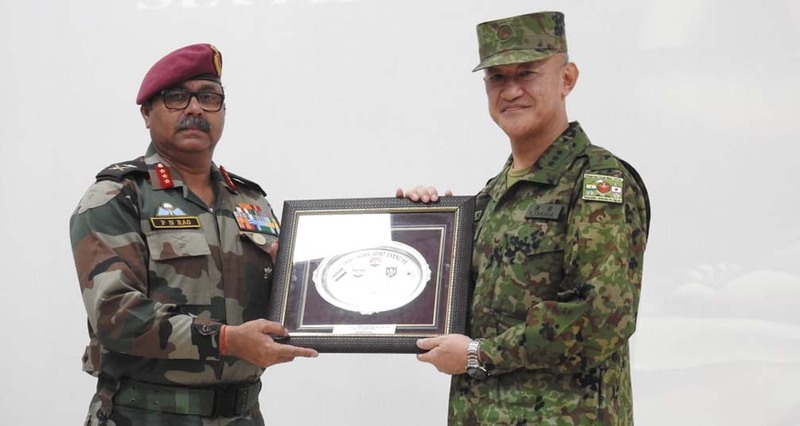 The exercise provided an ideal platform for both contingents to share their operational experience and expertise while also being instrumental in broadening the inter-operability and cooperation between armies of India and Japan. “Observers of both the nations appreciated the professionally conducted training which resulted in instilling confidence in each other’s capability,” the defence PRO added. The Meghalaya-based defence PRO also uploaded some of the images of the concluding ceremony of the joint exercise on his official Twitter handle on Wednesday.